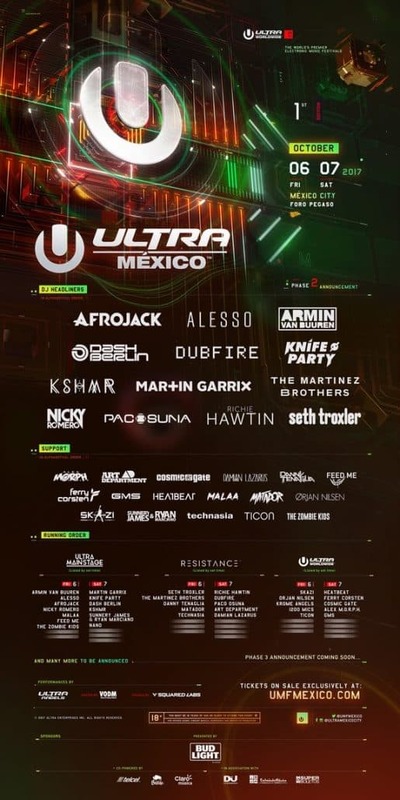 With over 80,000 fans expected to attend the debut of ULTRA México’s first ever 2-day event, the festival now announces its immense Phase Two lineup. Featuring a wide array of international talent, Phase Two sees Knife Party, KSHMR, Nicky Romeroand Paco Osuna join aforementioned headliners Afrojack, Alesso, Armin Van Buuren, Dash Berlin, Dubfire, Martin Garrix, The Martinez Brothers, Richie Hawtin, and Seth Troxler. Phase Two support is RESISTANCE heavy, with Art Department, Damian Lazarus, Danny Tenaglia, Matador, and Technasia set to bring their techno flair to México City. Additionally, Cosmic Gate, Feed Me, Ferry Corsten, Malaa, Nano and The Zombie Kids have been announced alongside Heatbeat, Orjan Nilsen, SKAZI and Sunnery James & Ryan Marciano.